Today we are going to find out how many kilo watt hours of electricity a PV solar system will produce if it was located in the city of Chicago, and of course if there was no shade on the PV system. There are a few different ways to figure this out. This post will explain the simplest way to determine the solar energy production. -The location that we will use to come up with an average sunlight hour number is Chicago, IL. The average number of sunlight hours there is about 4.4 hours per day. (Of course there are many more hours where people would consider it to be “light out”, but all “light out” hours are not equal, we need to average number of hours that solar panels would operate at maximum efficiency, othewise the math that would be needed for “its light outside hours” gets very complicated and returns the same answer. SO, in Las Vegas, Nevada, you could expect a 5.0 kwh solar system to produce approximately 6,804 kilo watt hours of electricity per year. One of the assumptions is that there would be no shade hitting the solar panels as that would adversely affect the electricity production. Just think of it like this, if there is shade from a tree hitting the solar system for 20% of the day, the electric production of the solar panels is likely to be exactly 20% LESS than the number above, that’s a BIG BIG difference, and something you want to avoid. When you are buying a solar system in Chicago, be sure to ask the solar professional to explain the expected sunlight hours to you. This is quite possibly the most important bit of data you need to know before writting any checks. 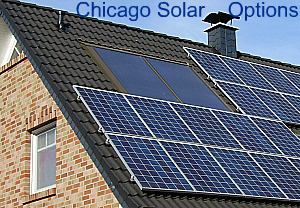 Also, since Chicago is a very progressive city in some respects, you might just luck out and run into a great Chicago solar incentive program when you are speaking with the local solar installers. Make sure to ask them what the current incentives are, it can save you bigtime on the solar purchase.